Have you even seen Walmart’s new private label brand, MoDRN? 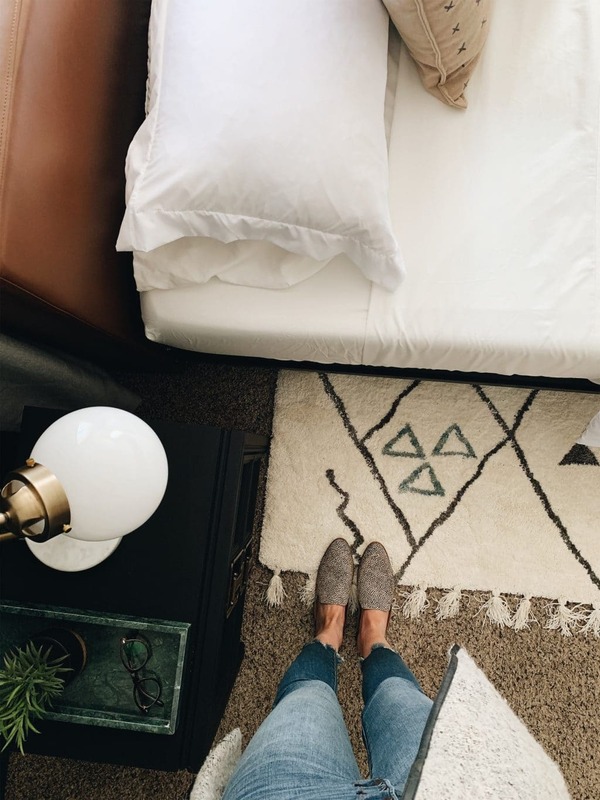 It’s really good and filled to the brim with drool-worthy furniture, decor, textiles, accessories–everything you need for a more modern home at affordable prices. They asked us if we’d want to share a few of our favorite pieces with you–but you know we love to show you how we’d use them when we can. Our friends, the Pugmires, were in dire need of a bedroom makeover. We gave them our old bed when we upgraded a few years ago and our old nightstands (and our old mattress!). Haha. They’ve always been so gracious. 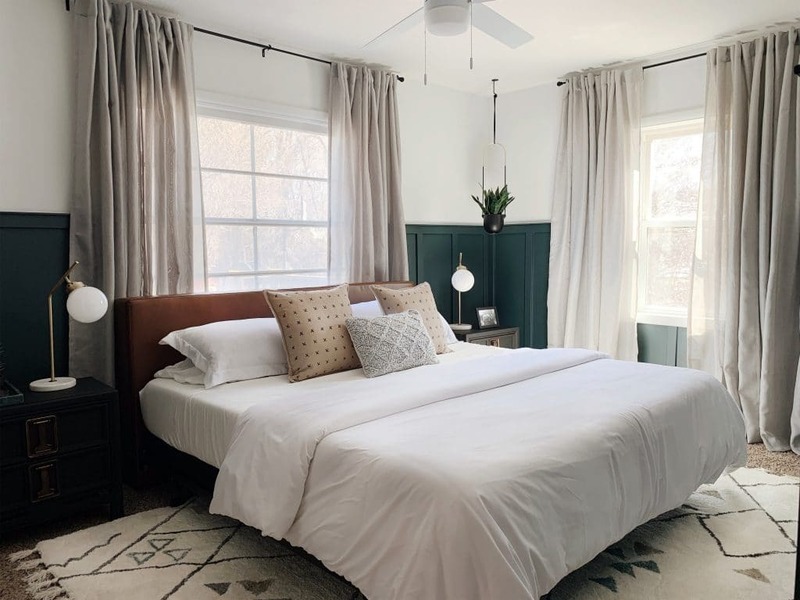 But we really wanted to give them a bedroom facelift that would take their hand-me-down bedroom to master bedroom status. A real retreat. The smaller 11×14 bedroom was tight to begin with, but there were a few tricks we implemented here that made it look a lot larger. The first was adding the board and batten to the wall. We purposefully only added it just over half way so there was lots of white breathing room up top. The vertical lines make the room look taller the deeper colored trim on the bottom help ground the room as the walls blend into the ceiling. Another visual trick we played is going for a lower bed. 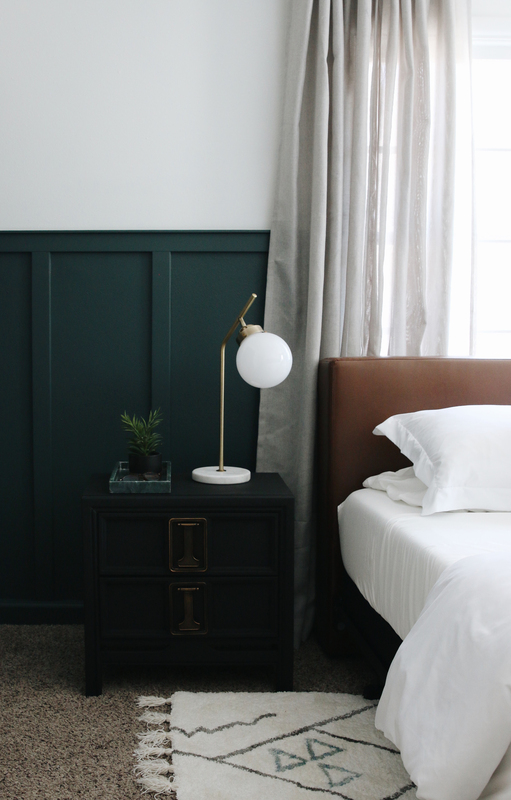 This faux leather headboard is one of my favorite pieces in the MoDRN line. It’s the most beautiful leather color and it’s think and solid and cushion-y. It’s great. We attached it to a simple king-sized bed frame that was lower to the ground and got a thin box spring to maximize how much of that headboard we’d get to see. Lower bed = more visual space! 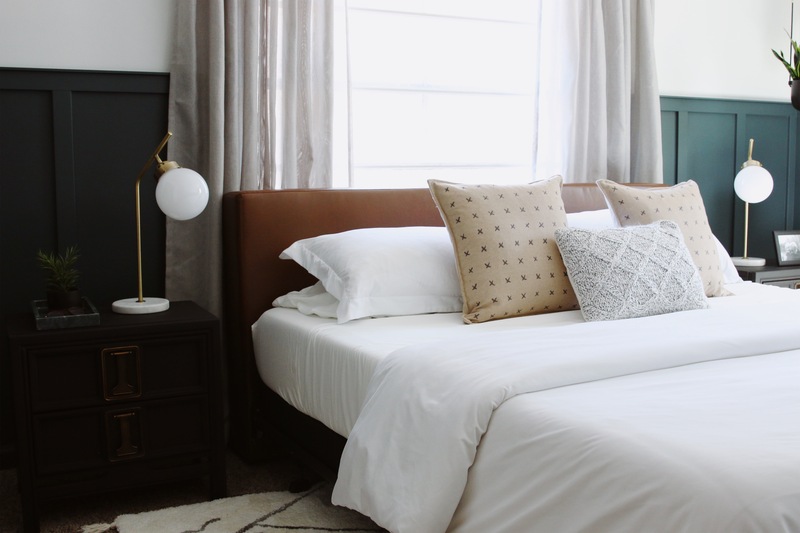 We kept the bedding simple and white with these super soft sheets and this no-wrinkle duvet (We didn’t even have to steam it out of the package!). The pillows are all from the MoDRN line and I’m definitely getting the tan x pillows for our house. So good. 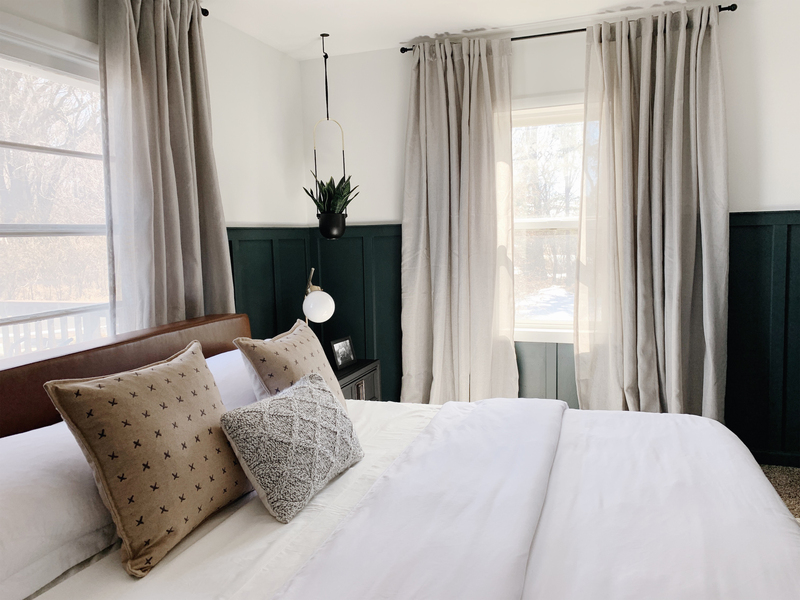 Last tip to make a small room look larger–remember the curtains from before? Real short. We actually used the existing curtain rods! 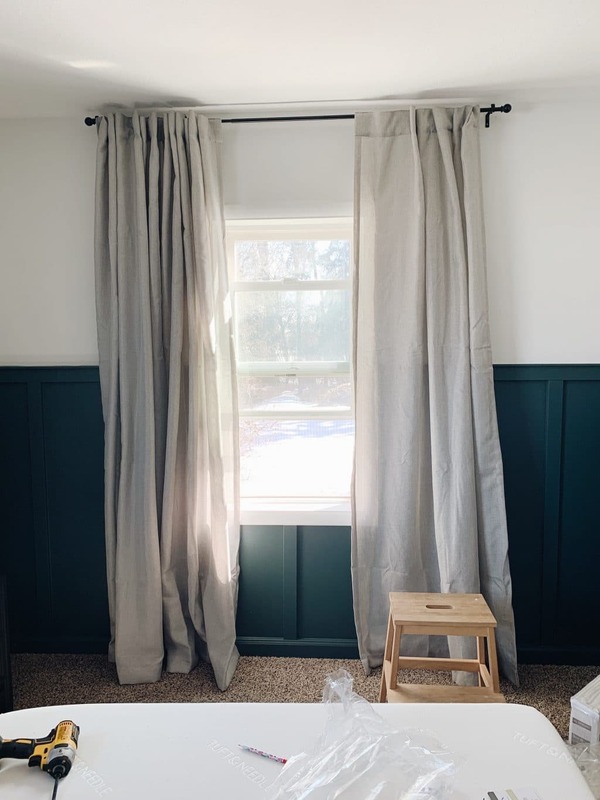 Stretched them out and moved them up to the ceiling so that small window on the side wall could appear a lot larger and the 96″ curtains would stretch the whole room out. Corine so sweetly said–It’s like an instant eye lift! Yes. For your room. 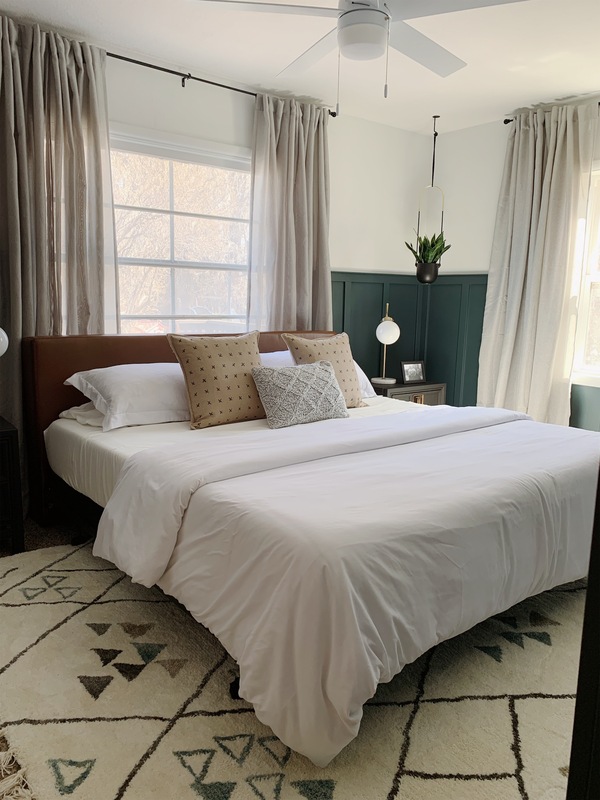 These pale gray 52×96 basketweave curtains from the MoDRN line are only $25 for the pair! So I doubled up on each window to make it look even more luxe. Above you can see one panel on the right and two on the left. It’s not necessary, but for $25/pair I mean! Go nuts! 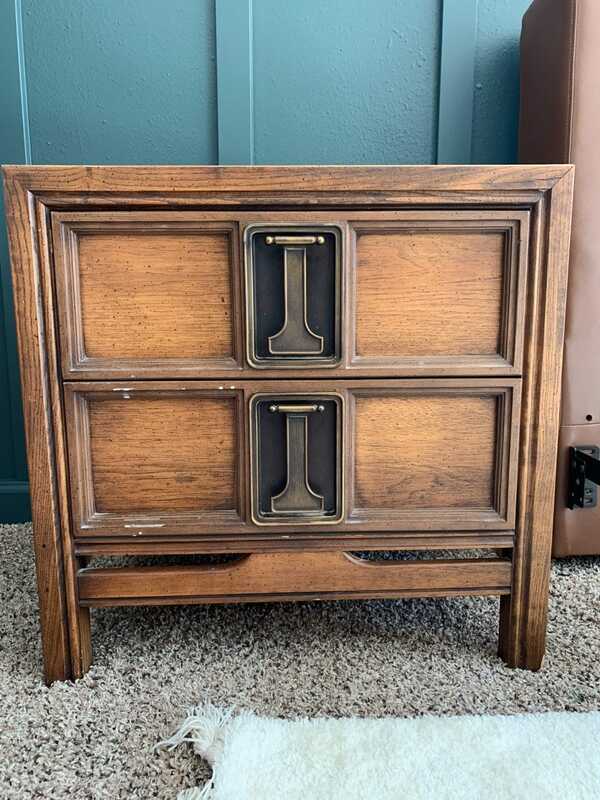 A few other standout details include the old nightstands we got on Craigslist years ago and painted with matte black chalk paint and they look 100x better and allow the accessories to stand out. The lamps! 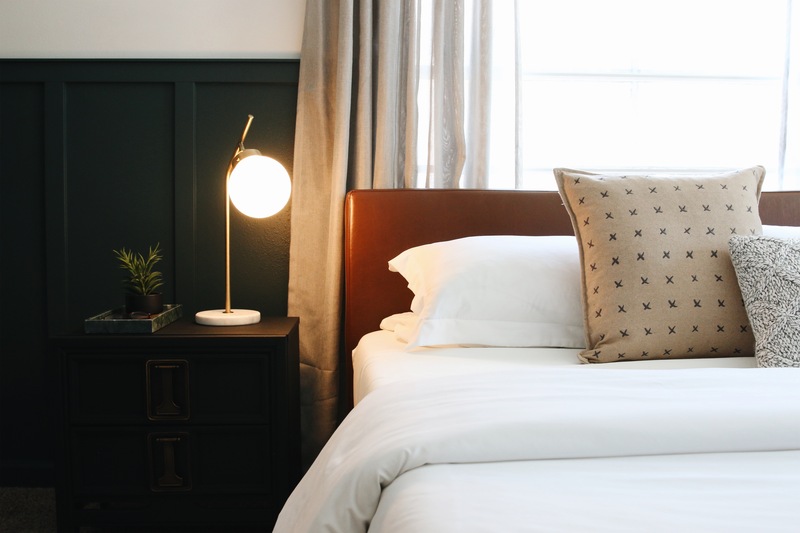 They really look like they belong in a high-end boutique hotel–they even come with bulbs! That really heavy, green marble tray (so heavy!) is also from the MoDRN line and let’s not forget about the rug we layered in the room. 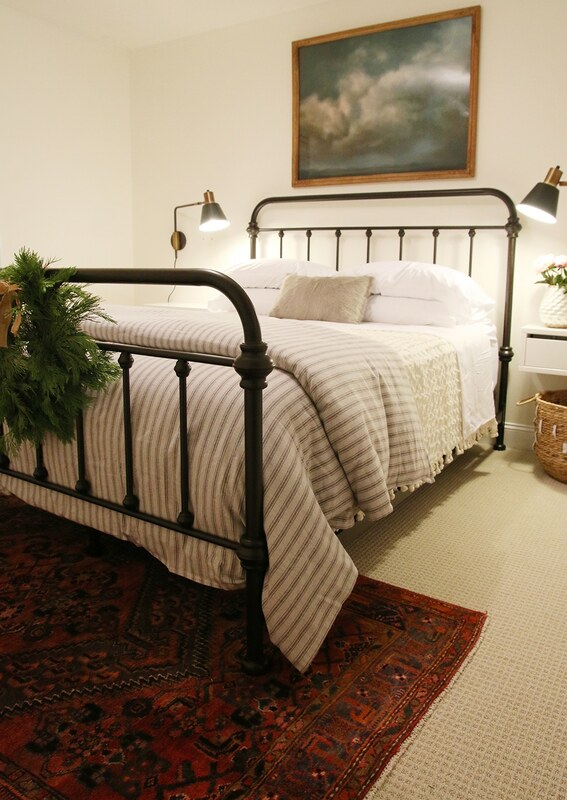 We used this pretty 8×10 under this king and it added an extra layer of coziness and a lot of interest to the room, too. 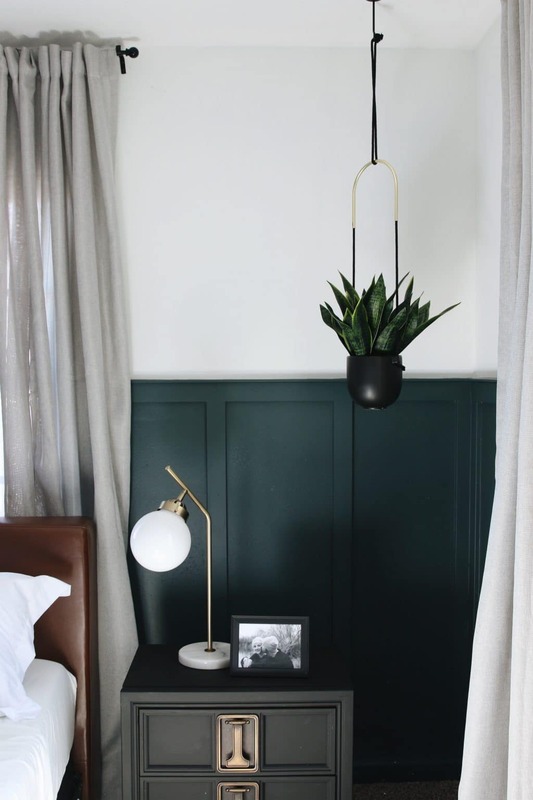 This hanging planter is such a good price and added the touch of greenery that every room needs without cluttering up a nightstand or precious floor space. For the first time, the Pugmires truly love their bedroom and that makes me so happy. 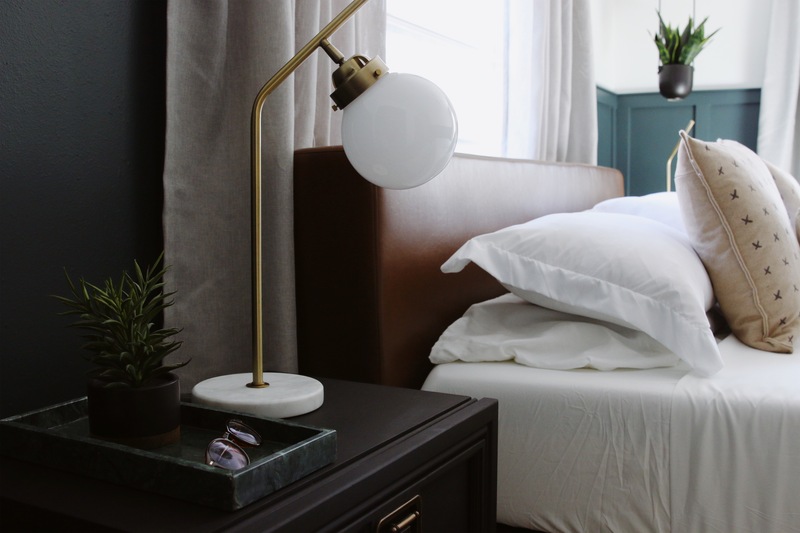 Everyone should love their home, but loving your bedroom allows you to sleep better, wake up refreshed! 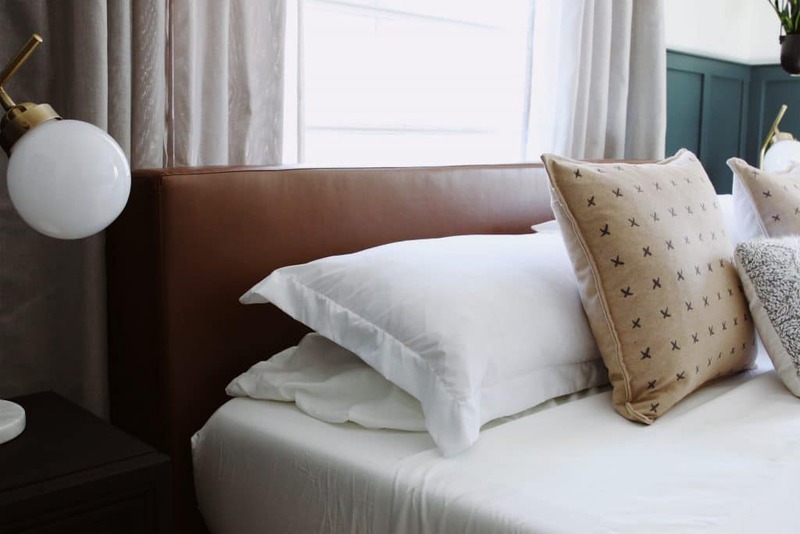 Making your bed doesn’t feel like a chore and you have a true retreat in your home. Here’s one more before and after with all the sources below! The curtains are now listed on Walmart’s site for $44. Do you think they jacked up the price because they were getting so many hits with the traffic you were sending their way? The room is beautiful! Do you and Chris have a mattress you love? Looking for recommendations. We use Sleep Number and couldn’t love it more. The curtains at your link are showing $44 for the pair, not $25. Are the ones at the link the same that you used? The price was $25 when this was posted but will fluctuate from time to time. The trim was Sherwin Williams Bright White, which is the same color as the upper part of the wall. I love this room! What color did you use on the upper half of the wall? I like this one! The colors are great. The rug is perfect. Unfortunately, she still has teen clutter and needs more seating for when her friends hang out. If I can figure out how to integrate more of the ‘teen” stuff into this room, it might work. You guys are such an amazing team! This is so inspiring. My husband and I just bought a fixer upper. Do you recommend using anything in particular to put together mood boards like this? I want a beautiful way of showing my ideas to my husband / contractors, and curious if you just use photoshop, or Sketch, or something else we should check out! I’m craving the beauty and simplicity of yours! We use photoshop, but Pinterest boards work great as well. im wondering what their closet doors are? Are they white or painted? We painted them to match the upper section of the wall. Sherwin Williams Bright White. While the WalMart fan you linked out to is a great price, I like the look of the light on the one you actually used. Any idea of a source for it? I think it was picked up at Lowe’s. Fantastic transformation! I’m about to pull the trigger on the bed (king size) but for the LIFE OF ME cannot find the dimensions on Walmart’s website. Can you help? Does the bed have a box spring on it or is the mattress sitting straight on bed frame? Cant tell since your not usinging a bed skirt either. We bought a shallow box spring from a local furniture store. Oooh, that comforter cover is sad! How bout a muted pattern-stripe? For a really big window (I’m talking probably 6-8 feet wide), would you use three panels on each side (six panels total)? You definitely could, but I think that 4 would be plenty, too! Each panel is 52″ wide. This looks beautiful! The sheets look a tad creamier than the white duvet- is this just visually in the photos or are they a bit off from each other? I was just on the website looking at purchasing both! Thanks! Seeing the bed frame in the room makes me love it! I wasn’t sure about the quality when I looked at it online. I also love that you put the bed in the same spot. The lower headboard totally works! Nice! I am really enjoying this partnership with Walmart because it feels so accessible. Can you please ask Walmart to bring the MoDRN line to Canada?! Tried to order some of these items online but the Canadian site does not have MoDRN yet. I love this so much! Any chance you’ll do a cost break down for the whole room including the materials for the walls? I’d love to know if this was an under $2,000 project or not! We shared the board and batten total in this post and everything else is linked in the bottom of the post! Sorry, I wish I did! We’ve only had kings. Wamsutta Dream Zone 750, the deep sheets. We swear by them. We grab at Bed bath and beyond, and you can use those annoying but useful 20% off one item coupons… and I check out like 4 times. Haha. I kinda want to do this exact refresh to our master bedroom!!! Love it!! That green on the walls is SO good. Wondering about a dresser or closet storage…are they able to store everything in the closet(s)? They don’t have a dresser (neither do we!) so they put everything in their closet. Love the transformation! 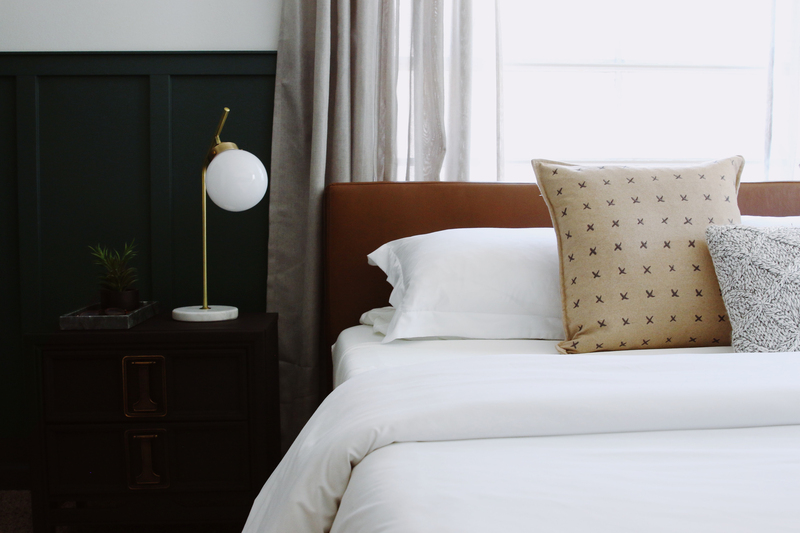 Can you share where you purchased the black bed frame? I currently have one that’s gray and huge and sticks out in the corners. Love this look best so I wouldn’t have to add a bedskirt. Plan on getting this headboard too! You have 2 mattresses on there, correct ? Thanks!! I’m really loving this headboard but am concerned about the quality/how it looks compared to something that is real leather. Can you share your thoughts please! Really wanting to purchase this but a bit bummed there aren’t any reviews online yet. It looks amazing! The color is spot on and doesn’t look plastic or fake at all. Very similar to our real leather chairs in our office. I’ll see if the homeowners can chime in with that info. This is so good!! I know you guys were debating the bed placement. How did you ultimately decide to put it on the window wall rather than the blank wall? We have an awkward window arrangement and have struggled on where to put our bed. We ultimately let them decide, but love the placement they chose. The door is across from the bed so you walk in seeing the bed and no one has to walk all the way around the room to get to their side. Did you put anything on that empty wall that the bed faces? Wow! Absolutely stunning! And I have been hunting for the right headboard for our bedroom and I think that might just be the one! That would be awesome! I’ve been checking the comments to see if they have been updated yet since a few other people asked the same thing, but I don’t see anything yet. Thank you! Looks beautiful! How are the window treatments with handling privacy? I’m wanting to swap out my old blinds but I’m clueless and privacy is a big issue in my home. They live in the country, so it’s not a concern, but layering blinds (maybe some pretty bamboo ones!) under the curtains wouldn’t be a bad idea! I love this! 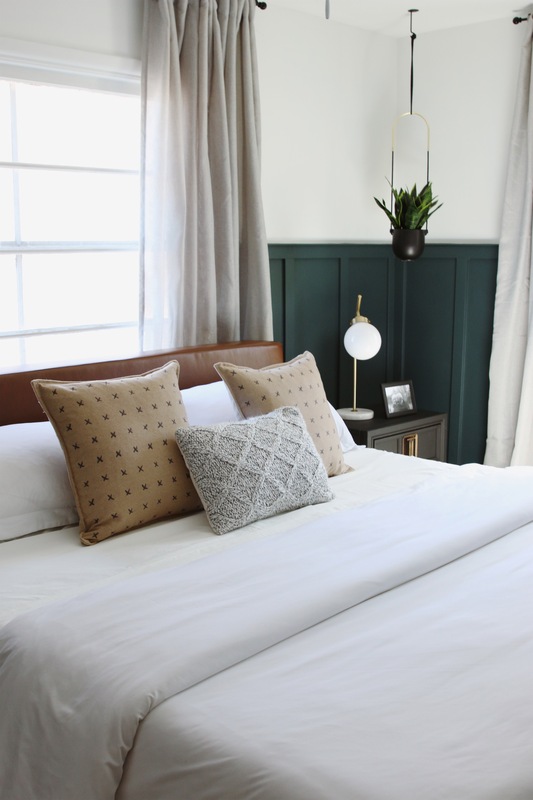 Why did you choose chalk paint for the nightstands? Is it better than a latex paint for veneered surfaces? Does it need a primer? Yes! It adheres really well and there’s no prep or primer required. 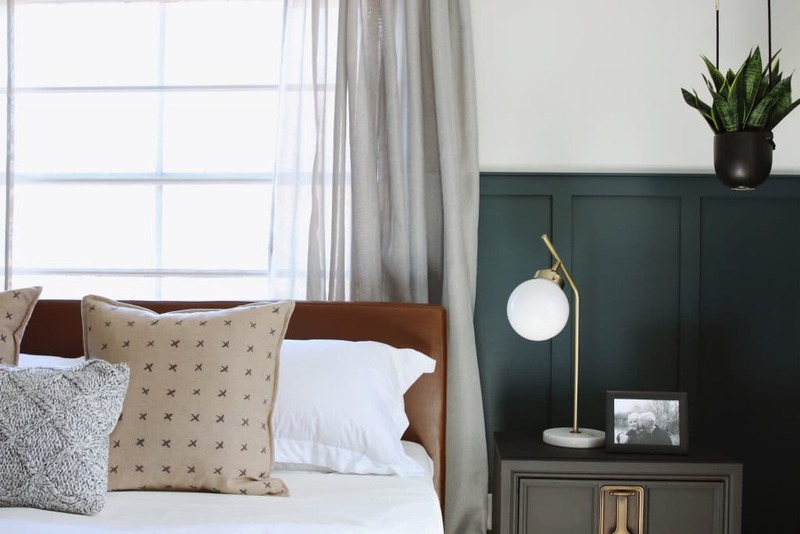 Could you link the paint you used for the nightstands? Contemplating doing the same thing on an old set. TIA! We used Amy Howard chalk paint in black from Ace Hardware! I’m sure I’m not alone when I say that being on EST really stinks when you’re waiting for a CLJ post! Anyway, I’m going to just go ahead and copy this entire room! I already have a hook in the ceiling just waiting for the hanging planter! Question, do they not have a dresser? Also, do you think a wall mount TV would look ok above the lower wall treatment if it is pretty flat on the wall? I’d love to get rid of our big entertainment cabinet. They do not have a dresser! Just a closet, like us :). I think it’s pretty common in smaller bedrooms to not have a dresser in the room. Totally! They haven’t decided if they want a TV or art, so we left the wall across from the bed blank for now but it still looks so pretty because of the board and batten. Amazing!! 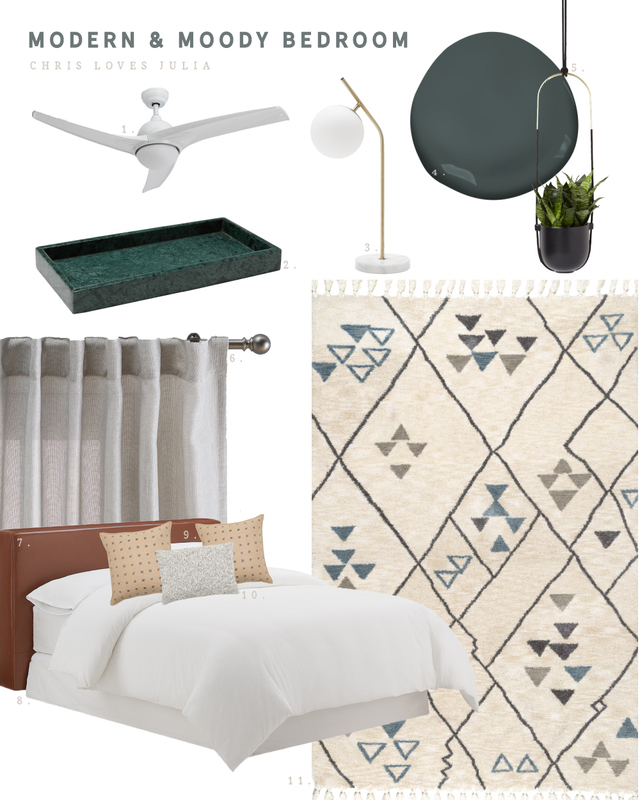 Will you be doing a post at all about that ceiling fan? It’s the one thing in my home I’d really like to replace (we have 3, ugh) but my husband seems so nervous to change them out, even though he’s very comfortable with electrical and replaced a tons of lights in our home. Would just love some tips. Thanks! Changing a ceiling fan is about the same as changing any other light! I love that you always add a customized or built in element to your renovations or make overs! And oh Corine, those sad, short curtains! 🙈 I’m so glad you were able to give such an amazing friends a special getaway! Looks great, Julia! May I ask what (or if) y’all did anything on the wall facing the bed? 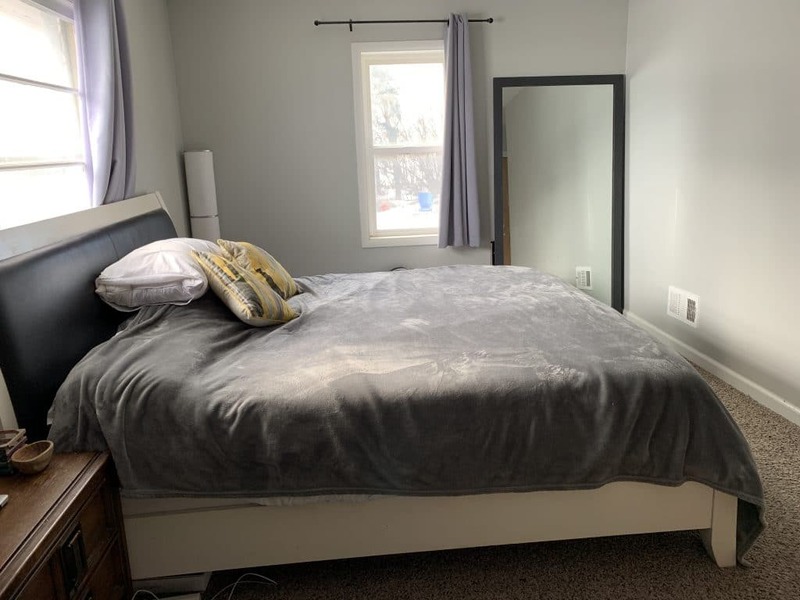 None of the after pictures showed it and I’m curious if it’s just blank, a mounted TV, or what you would do with the empty wall across from the bed since the bed is in front of the window? We have a similar issue at our home and the reasoning for putting the bed on the wall would be because I don’t know what to do with the wall otherwise if the bed went in front of the window! Thanks! They haven’t decided if they want a TV or art, so we left the wall across from the bed blank for now but it still looks so pretty because of the board and batten. Hi Julia, for the night stands, did you sand them before the paint? 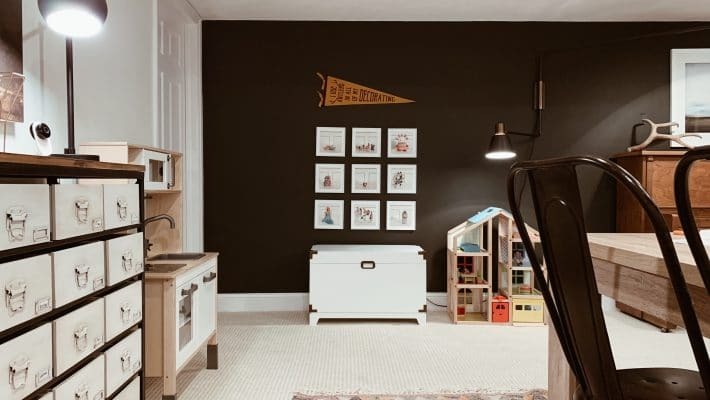 And which matte black chalk paint did you use? Thank you! We used Amy Howard brand from Ace Hardware. No sanding or priming required. We just wiped them down and painted! So easy. Fantastic job! What kind of chalk paint do you use, and do you use the wax finish as well? I love it so much I’m purchasing the duvet and sheets! If I’m reading in Feedly and I click the duvet/ sheet links, will you receive credit? If not, how do I purchase the bedding so y’all receive credit? Thanks! I love it! What a transformation! Any tips for layering rugs on top of carpet and having them lay flat? We have newer carpet that is more plush than our last one and my bedroom rug WILL NOT lay flat. I finally rolled it up and put it away in frustration. If you have a thicker carpet as your base, you may want to use something a little thicker to layer like the one we used here! Awesome!! Loving these doable/relatable/approachable design posts lately. Did you move the mirror or the dressing area in front of the bed? They actually have it right outside of their room right now because they love the openness, but they are planning on tackling their closets next and want to incorporate it there. Love everything about this makeover . The Pugmires are such a “cool” couple . This seems to really fit their person aesthetic . Like most parents we tend to leave our bedroom for last and invest in other areas of the house . But at the end of the day you really want and need your room to feel like a sanctuary. Well done Marcums! Does the hanging planter come with the faux plant? The 3 pictures on Walmart’s website show three different plants, making me wonder if you must buy the faux plant separately. If that’s the case, will you please provide the link to the one you used? It doesn’t come with the plant. And funny, the planter and faux plant was actually a last minute addition by another friend of ours so I don’t know where the snake plant is from! The Pugmires are so loved. The board and batten looks so good. 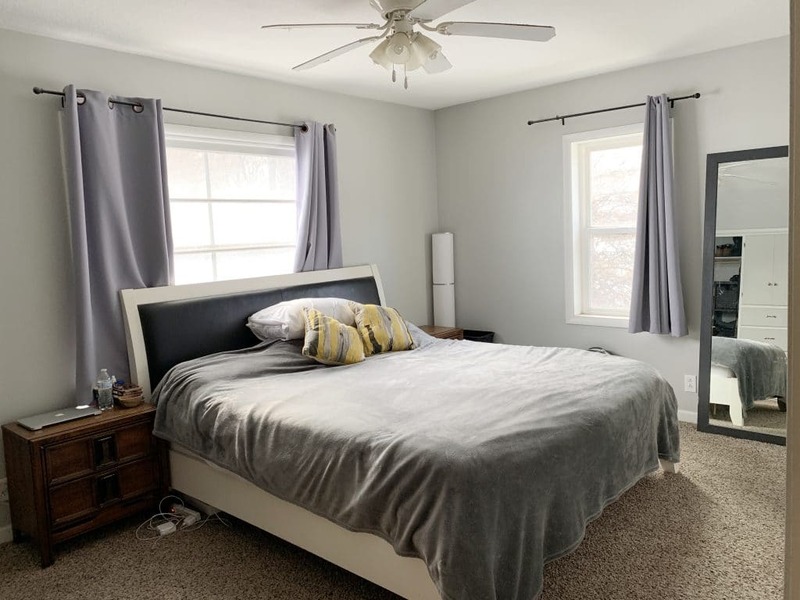 We have a 9.7 x 7.9 spare bedroom, do you think board and batten (done in a similar fashion) would make the room look smaller or be a nice accent in the space? I think it would be awesome! Love how you transformed the entire look and feel of the room! Can I just echo what a lot of others have been saying?! – I LOVE these practical, everyday-people home upgrades and tips! I showed my husband the board and batten and I think we are going to attempt it in our office! Thank you for being so real and for showing us how to make normal things beautiful and to work with what we have. It’s a good lesson for us all to keep in mind anyway and I feel like you two highlight it so well. So thank you and go CLJ! Plus- go Walmart! Excited that there are more affordable yet still gorgeous options for a tighter budget! Wow! Looks amazing job well done. Thank you so much I just ordered the sheets. What a smoking deal $32 for king split sheets. Thank You. Also do you do any design work out of state? I desparately need help. Your Instagram and blog have inspired me so much. I am just notorious for buying the wrong size furniture and can never make a decision. What does the other side of the room look like? We have a similar room layout! This headboard is SO good! Way to go, walmart!! You’re killing it with the bedrooms lately! I’m taking notes for my future bedroom as we’re moving in a month to a home built in 1866. Do you have an insta? I LOVE old homes and would love to follow! I love how it turned out! I noticed on your IG there was a lot of debate about whether to pain the window trim green or white. I loved how it looked painted green and voted for that option. However I think ultimately it is best for the window trim color to match (tonally) with the window treatments. I noticed that in your inspiration photos. The rooms with gray board and batten and gray window trim also had gray window treatments (same goes for the pink, etc). Anyway, looks great and you guys definitely made the right choice! Where did you purchase the actual fan you used? I’ve been looking for a white one that has clean, straight lines. The room looks awesome! I think this one is from Lowe’s. Ahhhhh! Just love it. So good. Worth the wait! Are you going to share the process of painting the nightstands? I’m curious if you just put the paint straight on or if there’s a prep process. Also what paint exactly did you use? These are my favorite posts! I love when you go into a new home and complete a weekend DIY update. Keep I up!!! I love this makeover! And Hello Walmart!! Round of applause! I also have the same size bedroom. I recently moved my bed in front of the window and need a new headboard. But ugh night time creepers can sneak up on me!!!!! 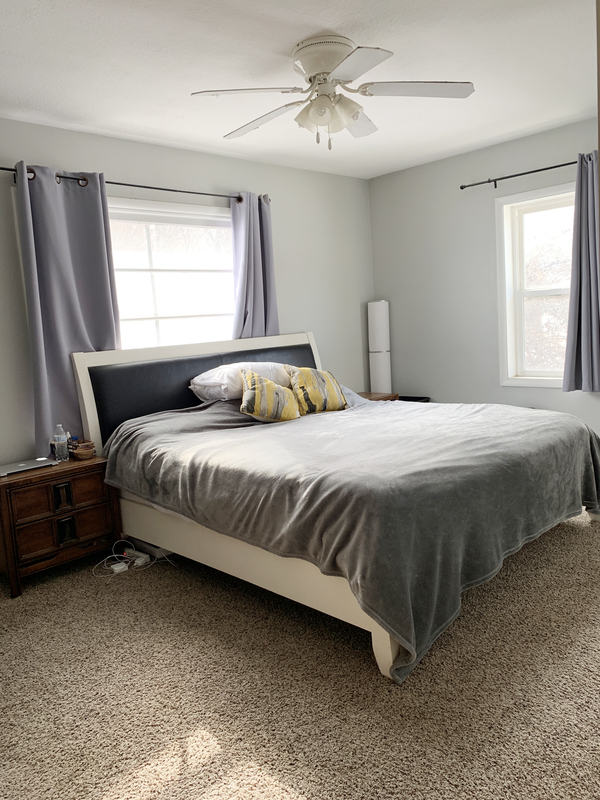 Do you have any ideas of what you may have put over the bed for art if you had chosen putting the bed on the other wall vs the window? I was looking at long, thin art. Looks great! Quick question… did you link the exact fan you use in the room? It looks a touch different. Can you link the actual fan used? Or is it not from Walmart…? I think it was picked up from Lowe’s. Any chance or you could link to the exact fan you used? Amazing! This line looks great! The fan linked doesn’t seem to be the same as the one in the photos. Can you share the fan source? I can’t find the exact one we used online! The room looks amazing!! You guys are incredible. I’m going to copy this bedding look for my room. What duvet did you use in the duvet cover? Also we have a cal king bed and the bed skirt only comes in a king. Do you have any other suggestions for a bed skirt? You know, I got the bed skirt and ended up not even using it because we liked the clean lines better. I will say the king was dragging on the floor a little so it might be perfect for a cal king! We used the duvet they had. The door is across from the window/bed and they really liked walking in and seeing the bed, plus they didn’t want to have to walk around the whole room to get to the other side. Ultimately we left it up to the homeowners! We had our bed on our non window wall (also the entry door wall) for 5 years. We finally tried the bed in front of the windows (facing the door). What a difference! Putting the focus on the focal point -the bed- makes so much sense! This is amazing! It looks beautiful and makes me feel like I can achieve something similar for our home. Thanks for always being a source of inspiration! This is stunning. I LOVE it. You know, some designers constantly work with houses that have such interesting bones — high ceilings, historic details, etc. And that’s fine, but it’s a lot easier to make those homes look good, IMO. 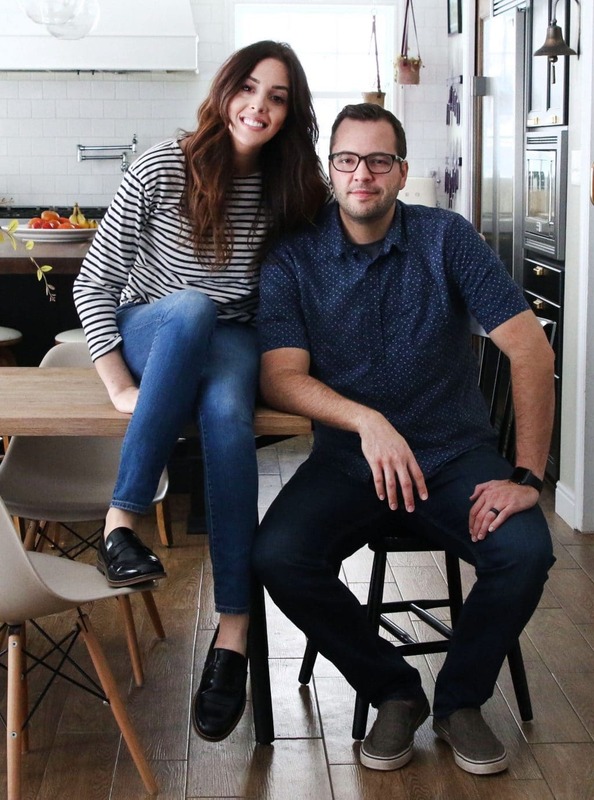 You make normal homes — that the majority of us all have — look amazing and it’s so much more helpful in terms of tips and tricks that we can apply on our own. Thank you for what you do! You guys, this is great!!! Love it! And love the budget. Usually not a fan of Walmart, but it looks like they are stepping up their game. That rug is fabulous! LOVE it!! What about the creamy color on the walls? Looking for a lovely creamy tan color. Exactly the kind of posts I love to see! Achievable DIY projects with great results. Honestly, the best thing you did was raise that curtain rod and stretch it out to give the windows more impact! Not to take anything away from that amazing wall treatment. They probably hate to turn the light off at night because it’s that good. I agree. The curtains made a huge visual impact. Looks incredible! I’m confused about the number of curtains. You say you doubled up but then highlighted the window with 2 panels on one side. So is doubling up 4 panels per window (2 on each side)? Yes, exactly. Normally you’d just have one panel on each side of the window, we did 2 so 4 panels for each window. These curtains come in a pair. This is just beyond good and I can’t believe this is all from Walmart. Usually I hate going in. It better not become my new Target, my wallet can’t handle that. 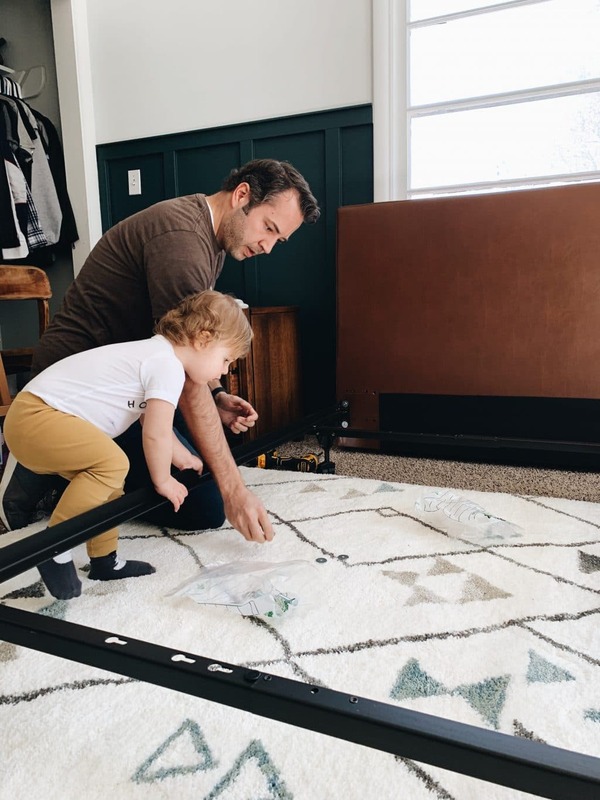 I noticed in some of the pictures the rug isn’t centered under the bed, I’m wondering if you did that to simply just show off the rug more or if you think a king size bed needed a 8×10 in this room? I know you have 8×10 in our own bedroom, so just curious how you decided the size! i’ve been refreshing all morning to see the final reveal. looks better than i imagined. great job. Such simple changes, im sure tons of people will be inspired! I’ve been waiting for this all week and it was worth the wait! So, so good!